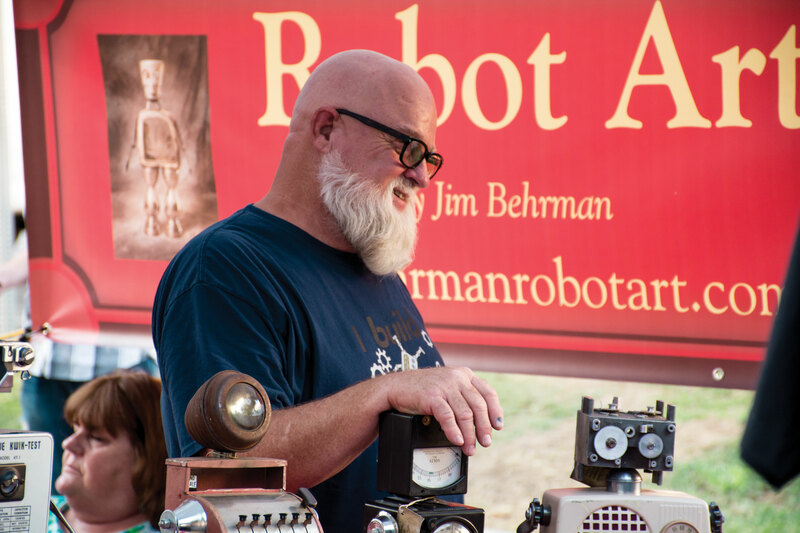 [Michael Naccarato | Banner] Jim Behrman, 62-year-old full-time artist, uses his past experience as a welder to make his robot art out of found items. Through his strong imagination, Behrman also creates motorcyles and cars out of various objects. 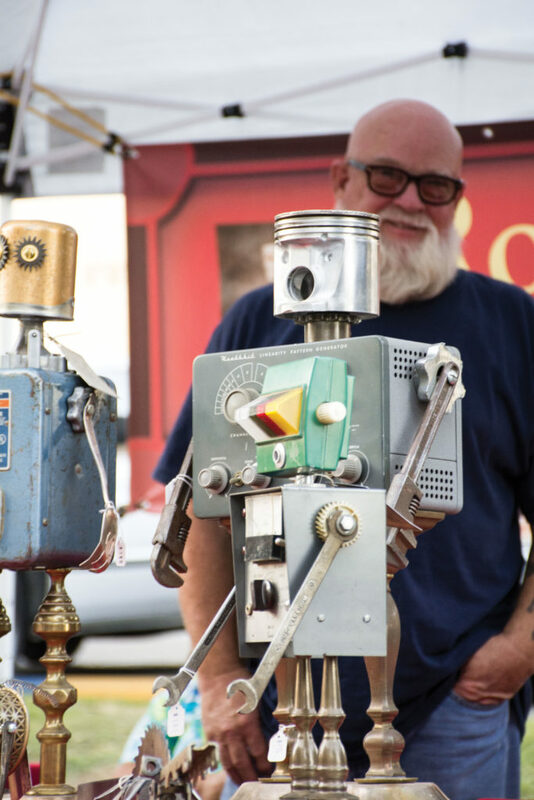 The Riverside Art and Music Festival is an event where those in the community have come to participate, enjoy and celebrate the arts for nearly 40 years. The festival took to downtown Riverside Sept. 17 and showcased local artists’ work, as well as live music. Allison Iraheta + Halo Circus, Naive Thieves and Castle Pines took the stage as artists set up booths and interactive activities that attracted all age groups. Sarah McMenamy, fifth year anthropology major at the University of California, Riverside, is part of an artist collective group called Downtown Locals Only. The group put together interactive stations in which visitors could participate. These stations included a chalk mural, face-painting and a collaborative collage of paint and paper mache. Downtown Locals Only attend other community events as well, often appearing at the Riverside Arts Walks, and “Thank You Grindly,” a monthly event sponsored by the local coffee shop Back to the Grind. Through these events they introduce others to their work. Mikaela Elson, sophomore fine arts major at Riverside Community College and creator of Downtown Locals Only, explained how the festival brings a wide range of people together over the common interest in art. “The purpose of Riverside Art and Music Festival is so people in the community can come together to express their own creative art form in a community-based melting pot,” Elson said. Jose and Annette Armas are other local artists who held one of the many eye-catching booths. Their station exhibited homemade work centered around Day of the Dead. Both Jose and Annette Armas have retired and are currently following their passion of creating art for a purpose bigger than themselves, promoting their heritage and remembering lost loved ones. They use this passion and their knowlegdge in business to create their business. Linsey Rahe, sophomore communication disorders major at California Baptist University, saw some booths tied their art with faith. Other booths displayed vinyl records, robots and homemade crafts. The event creates a space where people of all age groups and backgrounds could come together to both inspire and feel inspired within their art form.